I am lucky to live in London’s Bethnal Green neighbourhood on a multitude of counts – that number has increased with the recent opening of Square Mile Coffee roasters less than a five minute walk from my flat. One evening last week they hosted a tasting of espressos from New Zealand. The event was attended by 45 people and all proceeds were donated to charity. 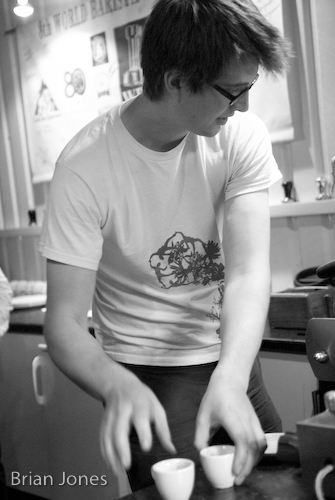 In just over an hour barista James Hoffman (pictured above) pulled more than 160 shots of the four espressos. You can read more about it on Square Mile Coffee’s own blog here. Square Mile was started up earlier this year by James Hoffmann (World Barista Champion 2007), Anette Moldvaer (World Coffee Cup Tasting Champion 2007) and Stephen Morrissey (World Barista Champion 2008). These people bring a wealth of experience with them and it shows in their coffees – over the last couple of months I’ve been drinking their espresso at a few coffee carts around town and I look forward to it being more widely available as they convince more cafes and restaurants to pull their espresso. Visit flickr to see more of my photos from the New Zealand espresso evening.